Simple, elegant and easy to move in shearling jacket. Made with Icelandic pelts that are extra light weight. They are exceptionally soft and supple hides, with equally soft fleece. They make beautiful coats and they're available in five different colors. 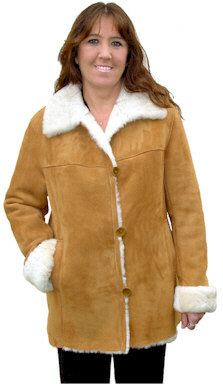 This coat features four buttons, slant pockets and adjustable cuffs. This is a straight cut coat, so it has a relaxed easy fit. Approximately 28" in length.